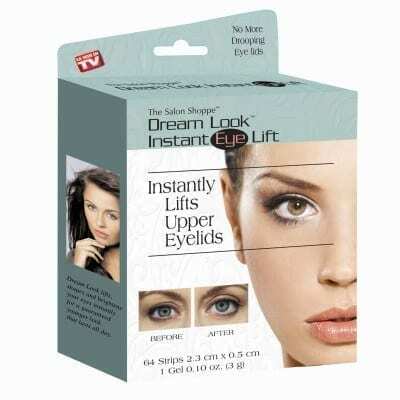 Original As Seen on TV Instant Eye Lift product. We are the inventors and exclusive manufacturer. Instantly lift your droopy, sagging upper eyelids in just seconds with Dream Look. Application is quick and easy and results last all day. This product contains our eye lift gel. Your eyes say so much about you. But drooping, saggy eyelids can make you look older than you really are. Now you can regain that youthful, fresh look you’ve always wanted. Introducing Dream Look – The Instant Eye Lift! Just apply the Dream Look invisible eye lift strip onto your eyelid and watch them gently support and shape your eyelid for a beautiful, natural lift. Dream Look is made of medical grade, hypoallergenic material, and it’s as safe and comfortable to wear as eye shadow. Use with or without makeup. You don’t have to have cosmetic surgery! Dream Look will give you the look you’ve always wanted instantly! Transform your eyes and take YEARS off your appearance! Lift your eyelids for a naturally beautiful look. Shape and define your eyes with amazing results.